Thank you to our friends at 3GEngagement for submitting this informative guest post to our team! What is the best way to structure your search campaigns to take advantage of the moments that matter most to your bottom line? Simple: you plan for it. So first of all, what is a micro-moment? Micro-moments are the moments where we reflexively turn to our mobile devices to act on a need to do something, buy something, or learn something. As a society, we’ve come to expect things quicker than ever before and if you’re not around to deliver on these moments, you’ve already lost. The theory is people will search differently depending on what stage in the funnel they’re at. For instance, somebody looking to buy a pickup might search for Ford F-150 vs. Ram 1500 if they are in the learn stage, or for Ford Dealership Near Me if they are ready to buy. It’s important that you understand the difference between how people search on their desktop versus on their smartphones. On a smartphone, the screen is smaller. I know, I know, thank you Captain Obvious. But, that brings me to my next point. A micro-moment is just that, micro. It’s a spur of the moment thing that happens because we want to do, buy, or learn something. Because of that, it’s imperative that you show up on the search results. Not only organically, but through paid ads with relevant landing pages. Let’s go over some strategies for how to win in these micro-moments. Is-It-Worth-It Moments – These moments happen in the store when people are trying to justify why they need to make a purchase. Can-I-Afford-It Moments – These are the moments that happen when a shopper is looking for list price. Where-Should-I-Buy-It Moments – Near Me searches have skyrocketed in recent years with shoppers turning to their mobile phone to find where they should make a purchase. Which-Is-Best Moments – When deciding on what to buy many turn to someone they trust. This can include reaching out to a friend, reading blogs or forums, or by searching review sites to ensure they are getting the best deal for their money. A Google search will show you many important moments, but the general idea here is to start out with a map. Begin as early in the shopping process as possible to define each stage, or moment, that a shopper goes through on their way to making a purchase. Make sure that you write a few sentences explaining what the needs of the shopper are in each particular moment. Once you are in the right frame of mind, start thinking about a list of keywords that coincide with those needs. Ask yourself how you, as a customer, would search in each of those moments, and what questions you would want answered. Check with people you trust to get their input as well. The next step is to think about how you can deliver the right context so that each moment speaks to what the shopper is looking for. For instance, if you have a retail location and you are open late, put that information in the ad. You can even display something to the effect of “open for another X hours” that will dynamically change based off the time of day. If you’re closed, tell the shopper what time you open and direct them to find the products they might be interested in on your website. The idea here is to tailor the message to what shoppers need most, which is why it’s important to define each moment and create campaigns accordingly. From there, it’s important to measure each moment separately. I’m not just referring to impressions, clicks, CTR, CPC and so on, but what’s also happening after the click. How many conversions are there? Adjust your strategy as needed. All micro-moments matter and if you want to win more of them it’s true that you have to be there for more of them. That said, if you can’t be present during all moments don’t panic, you’re still in the game. I’m not trying to complicate matters but I think it’s important to note that if you can’t be present during each micro-moment due to budgeting constraints, you should focus on the ones that help push the shopper toward whatever you consider a conversion to be. This is why it’s important to map your micro-moments. If you can’t be present during all the micro-moments then test each of them to prioritize and make sure you’re winning with the ones that produce the best results. Okay, so you have a responsive site. Great. I’m glad that you do, but that does not necessarily mean that your mobile site is user friendly. A responsive site consists of a mix of flexible grids and layouts that respond to a user’s screen size, platform and orientation. That means the screen resizes a page and will dynamically “rebuild” itself by moving on-page elements to fit the screen it’s viewed on. That’s all well and good, but is the call to action still where it needs to be? Is a big block of text the first thing people see when they land on your website? If your objective is to get a phone call, is your number clickable on a mobile device? These type of UX issues are the reason it’s important to look at the pages that your potential customers are landing on when they use a mobile device (in multiple screen sizes) to ensure that everything looks the way you want it to. Google has said that 53% of smartphone users will abandon a webpage if the site takes more than 3 seconds to load. Personally, I feel this is one of the big reasons why Google has been pushing the Accelerated Mobile Pages (AMP) project. Have you done the 3-second test on your own site? A good rule of thumb here is if you can do without it, don’t ask for it. For example, make lead submission easier for users by not using 12 different fields on a form. One last thought before moving on, have you considered creating separate ads for your mobile campaign? With Google’s device-specific bid adjustments, it’s now possible to once again run mobile-only campaigns. You can use them to segment your PPC data so that you can see what happens both before and after the click. The more hoops a shopper must jump through to get to their intended result, the higher chance you have of losing them to a competitor. Take a close look at your ad and the keywords you are bidding on. Are they specific? Do you have all the ad extensions needed to help the shopper to get to their intended results faster? Look at the click path – is it as short as it can be? If not, make the changes necessary to ensure that it is. Always, always, always look at how you can take a shopper from clicking on your ad to converting in the easiest way possible. Ask yourself what else can be done to make this process as short as possible. This is another reason why creating a micro-moment map is so very important, as the goal will be different depending on the specific moment. Your goal is to have the shopper’s interest turn into some sort of sale, but that isn’t always the goal of the shopper. Depending on where they are in their buying funnel, their goal will change. Knowing that will give you a better idea of the words to bid on and what landing pages will be most appropriate. To quote Bob Dylan, “The times they are a-changin’.” Too often marketers find themselves in the hurry up and catch up mode. To combat that feeling, always look at the data for answers. Analyze what’s happening and test as many different things as you can. I’m not saying you must take a deep dive into the data every single day, but do try to have a look every week. If you see something that seems off before your weekly deep dive, make sure that you take a closer look right away. It won’t take long to train your eye to spot a problem at a glance. I recommend creating custom reports in Google Analytics to help distill all the data available into the KPI’s that are most important to you and your bottom line. But that subject is a whole other post. Now that you’re looking at the data, do what it tells you to do, while keeping in mind that the goal is to improve your KPIs. Don’t wait until you’re behind – stay ahead by staying on top of the data. 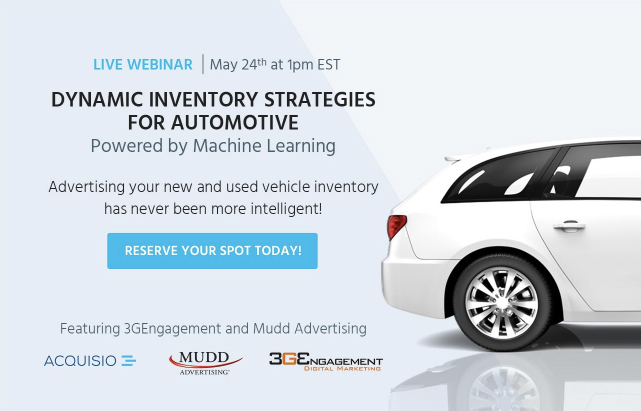 If you’re ready to optimize your strategy, check out our automotive focused webinar happening on May 24th, including a guest from 3GEngagement, Chris Hanson. Our industry experts will walk you through how automotive marketing has changed over the last few years, including how machine learning is powering dynamic automotive campaigns for optimized performance and better results. Webinar attendees will have the exclusive opportunity to test drive a demo tailored to the automotive industry, so you won’t want to miss it! Thank you again to David Johnson from 3GEngagement for putting together this really informative guest post! David Johnson got started in the auto industry as a salesperson at a Ford/Mercury store in Florida’s Panhandle. He quickly showed his prowess as a salesperson, averaging 25 cars per month, with perfect CSI scores. Soon he took over the internet sales department and grew it into a full fledged business development center (BDC) with 6 employees, handling just over 1000 leads per month. From there David was recruited to be a national trainer and traveled the U.S. teaching dealerships how to run a successful BDC through inbound lead generation, phone skills, emails, advanced CRM strategies and video email.